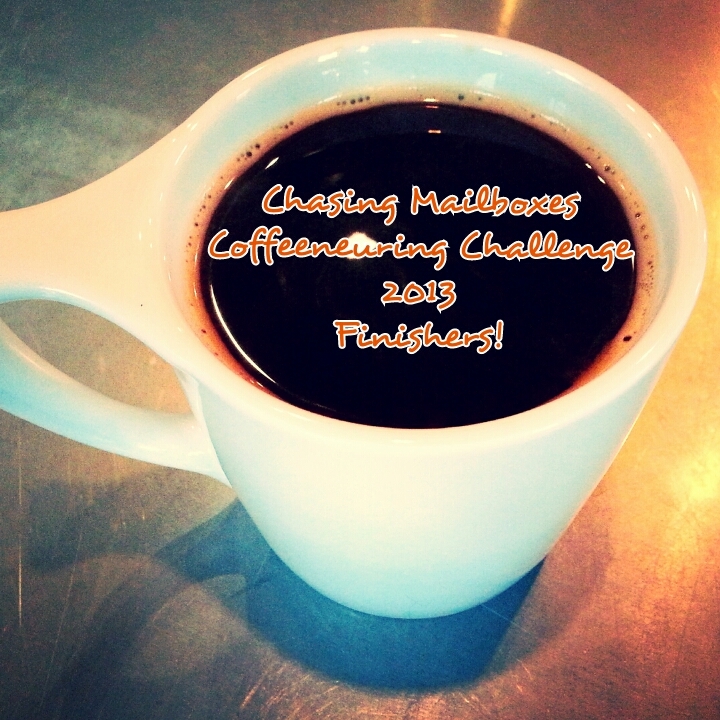 It’s a great day here at Chasing Mailboxes as I am announcing the official finishers of the 2013 Coffeeneuring Challenge! The 2013 edition of the Coffeeneuring Challenge is the largest yet, with 121 122 123 125 coffeeneurs following most all the rules and completing 7 rides to 7 different coffee shops over a period of 7 weeks. 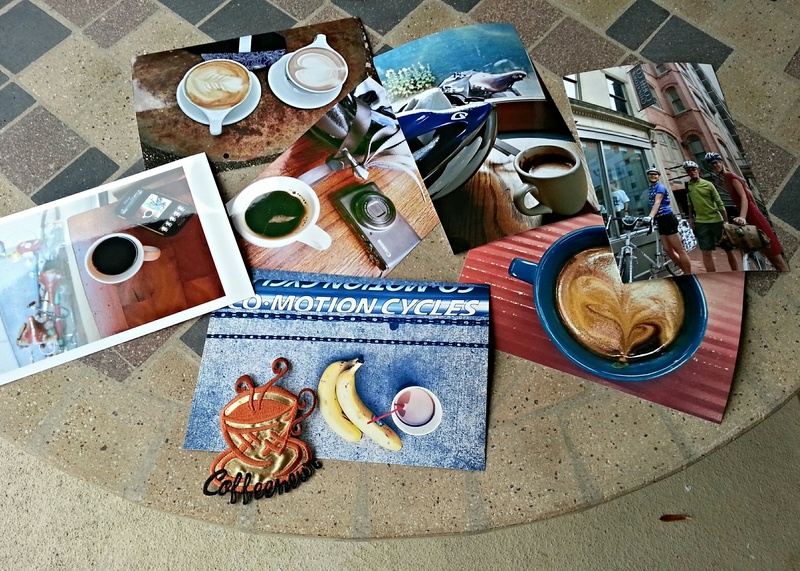 I have more to share about this year’s Coffeeneuring Challenge participants, including more fabulous guest posts, but for now I want to recognize each individual who finished the challenge and tell you what they’ve won. Jean R. @jerdlngr. Washington, D.C.
Lisa S. Rambling Rider. Washington, D.C.
Rudi R. randomduck Washington, D.C.
Sarah. I Have Ideas and I Like Stuff. Washington, D.C.
sprite. sprite writes. Washington, D.C.
What Did I Win For Finishing? This year’s premium is a custom patch in the shape of a coffee cup with the title “coffeeneur” embroidered in black letters along the bottom of the cup. I will be mailing one to each finisher and you may expect to receive yours around the new year. I will let you know when I send them out so you may know when to expect them. Hey, I Should Be On This List! Did I miss you? Was your submission lost in the ether? Let me know via the “Contact” tab and I will adjust the results accordingly. In addition, if there is any change you would like to make to how your name is displayed, please inform me of that as well. I made it on the “finishers” list of the Coffeeneuring Challenge. Yay! Yay! I! am! a! finisher! Thanks! for! the! exclamation! point! Doh! Thrown out for cheating, eh? Looking forward to trying again next year! Oversight! You ARE an official finisher! A few people did not get transferred to Ye Olde Coffeeneuring Spreadsheet! Phew! Though not quite as exciting as being tossed out for cheating in retrospect 😉 Thanks so much! Wonderful! Thank you so much. This is really above and beyond…Can’t wait to sport my Coffeeneur patch with pride! Thank you, MG for a wonderful event. I went through the list twice, and if I counted correctly, I am the only Vermont finisher. Come on Vermonters, for a state that is voted second healthiest, there ought to more than one on this list!? Next year, I’ll be broadcasting this event to challenge regional riders. Yay, I’m on the internets! Thanks again, MG, for organizing such a fun fall adventure. Hope you get a bit of rest around the New Year before starting up again. Hey, wait, the Rapha Festive 500 starts in just nIne days! Thanks, Mary, for making coffeeneuring happen! That’s an awesome looking patch. OK. I have a confession which I failed to mention while compiling my coffeeneuring adventures. On the way back from my final trip to City Brew, a wonderful Montana-based chain of coffee shops, I stopped by my favorite local brew pub, Carter’s, and had a pint. It’s just that the wind was in my face and I had worked up a powerful thirst, and besides, the sun was over the yardarm. Perhaps next year there could be a special category for pilsneering. porterneering? For Glory! For Coffee! For IOWA!! from the sweet little city of Fort Collins, much thanks for running the show! 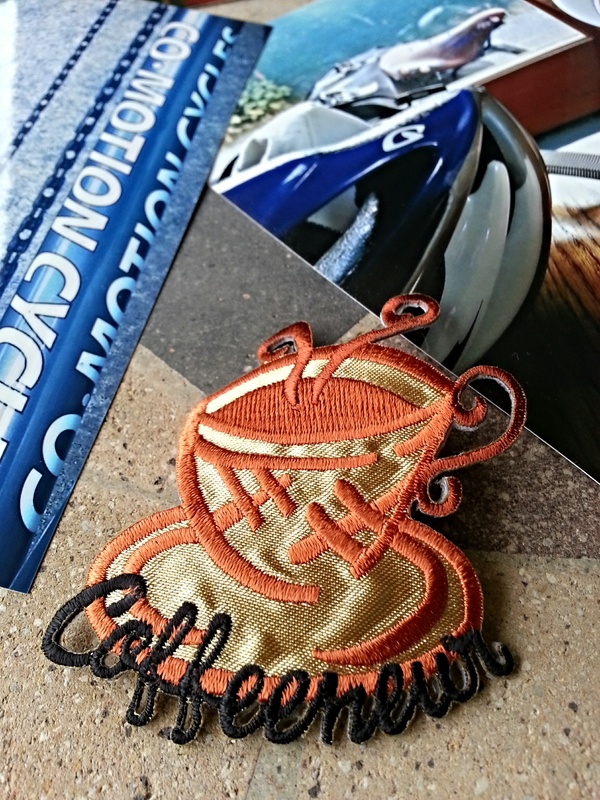 And hey, that patch looks great, can’t wait to rock it on the next #coffeeneuring run. Thanks for organizing this! I had a lot of fun getting back on my bike after a break this summer initially due to a minor injury and then extended due to major inertia. This was a great way to get back riding, and to do some more local rides than I usually due. Lots of fun! I am going to try to make it at least a monthly thing from her on. My first coffeeneuring completion! Thanks, MG! This was a lot of fun. Thank you for hosting it. I look forward to hot beverages again (via bike) next fall!